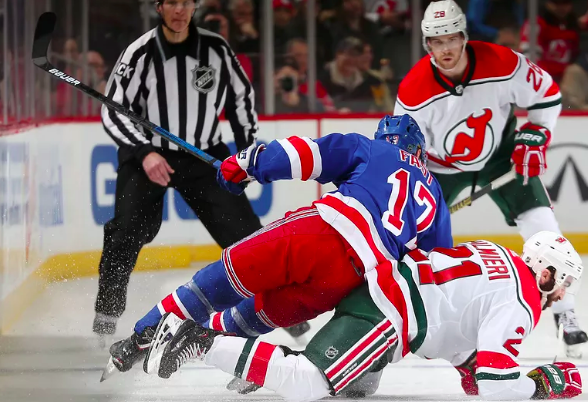 This past Thursday, January 31st, the New Jersey Devils faced off against the New York Rangers at the Prudential Center for a regular season game. With 4:36 left to play, NY Rangers’ Mika Zibanejad capped his second career hat trick with a winning goal to beat the Devils 4-3. Zibanejad also had an assist on a goal by Chris Kreider and Mats Zuccarello had three assists, including the backhand pass that set up Zibanejad for the game winning goal. For New Jersey, Nico Hischier, Marcus Johansson, and Egor Yakovlev all scored. “Losing is tough,” said Brian Boyle, who had a last-minute tip stopped by Lundqvist. “There was some self-inflicted stuff but it’s always disappointing. This was a big one. This was a big game for us. I think we had pretty good control of it but we’re still a work in progress” (espn.com). Kreider gave the Rangers a 3-2 lead early on in the third period with a shot from the right circle that Kinkaid failed to stop. Yakovlev got his second career goal after being set up by Johansson less than a minute after Kreider scored. The Rangers were able to make a comeback when they controlled play in Devil territory for more than a minute and got the puck to Zibanejad. Zibanejad got his first goal on a deflection with two seconds left in the first period to cut the Devils lead to 2-1. His second goal of the evening came with 3:24 left in the second period when he one-timed a pass from Zuccarello into the top corner of the net. Hischier gave New Jersey the lead with a shot from the left circle 5:10 after the opening faceoff and Johansson made a head-first dive to poke a loose puck into an open net. The way the line of Mika Zibanejad, Chris Kreider and Mats Zuccarello is going, the New York Rangers still have a shot at the playoffs. While the Rangers (22-22-7) lost to the Lightning 3-2 this past Saturday, they have a chance to make a comeback on Monday with a 7:00 PM against the Los Angeles Kings. The Devils (20-24-7), on the other hand, clutched a 3-2 double OT win over the Canadiens this past Saturday and face off against the Los Angeles Kings this Tuesday at 7:00 PM.